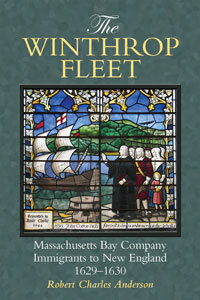 The activities of the Massachusetts Bay Company in 1629-30 were uniformly organized from the top down. The Company either purchased or hired the vessels to carry the passengers and provisions. The passengers themselves, and especially the critically important professionals such as ministers and soldiers, were recruited by the Company leaders. Yet this phase of the migration was brief, as most of the merchants involved found the enterprises for which all this activity was expended to be losing propositions and allowed their New England plantations to disperse, some almost immediately and most by the middle of the next decade. The influence of those leaders of the Massachusetts Bay Company who remained behind in England quickly faded away, and by 1632 the top-down direction of the migration process was essentially at an end. The Laudian Migration – a reaction to the threatening overtures of the new Archbishop of Canterbury – did not feature Gentlemen’s Companies or Merchant’s Companies. No corporate office in London organized and provided for these emigrants. There were fewer companies of allied but unrelated travelers; instead, migrating families generally made their way to the London docks, or less frequently to the docks at one or another of the outports, and signed on for passage in vessels designated for that purpose by their owners, who were not otherwise devoted to the colonization process. These passengers had to provide or purchase their own provisions for the passage and for their own use once on the ground in Massachusetts Bay. In contrast with the Winthrop Migration, the Laudian Migration was directed from the bottom up, the migrants organizing themselves around those Puritan ministers who chose to make the move to New England. In the typical sequence, a few families might precede the minister across the Atlantic, followed by the minister along with several more families, and then succeeded by a few more families who had been attracted to the group. It might fairly be said that the migrations of the 1620s – amounting to about twenty percent of the Great Migration total – was characterized by top-down operations, from the efforts of Sir Ferdinando Gorges and others to induce West Country fishermen to move their operations across the Atlantic, to the Leiden Pilgrims and the Dorchester and Massachusetts Bay Companies, all to some extent managed by wealthy merchants who organized passage for their followers. All of these speculations ran their course in the period between 1620 and about 1632. The remainder of the Great Migration consisted of the Laudian Migration, the only element of the migration organized on a bottom-up, spontaneous principle. There were fifteen or sixteen thousand immigrants in this group, mostly arriving between 1633 and 1640, after which events in England reduced the pace of travel to a trickle, signaling the end of the Great Migration. Most interesting! I didn’t know that. Explains quite a lot. Also means a more in depth look at my ancestors is called for. I wondered why and how William and Joanna (Blessing) Towne and family came over. I assumed it was the usual. Did they have family here? How did….? More to think about! Thank you. Indeed, I too am a Towne descendant and have often wondered about certain sets of these “uber-couples” who seem to appear out of no where. A very intersting post, and I think Paula is right on the mark when she says another look at our kin is called for. Matthew and Priscilla Grant left England for religious freedom. This must place them in the second group. Those interested in these topics may also enjoy Mr. Anderson’s article, “Congregations in Flight: The Beginning of the Laudian Migration to New England” in The American Genealogist (TAG) vol. 72 (July/Oct 1997), pp. 257-262. For a review of the above book, see the one by Dr. David L. Greene, co-editor of TAG, in NEHGR vol. 150, no. 1 (Jan 1996), pp. 94-96. Thank you, Howard! I will check them out! Fascinating post. My ancestors Maximilian Jewett came in 1638 with his wife Ann, brother Joseph, and a number of other relatives, with a dissenting preacher Mr. Rogers from the West Riding of Yorkshire. They founded the town of Rowley in 1639. The book Howard refers to won’t include them, but I’ve found many references in NEHGS that I haven’t yet tracked down. I understand the context better now. I have wondered why the Jeremiah Jagger family weren’t included in Great Migrations. (Not a complaint, as there is a treasure chest of genealogy in each volume). I’ve spent quite a few years, in my amateur, on-line quest to find missing links in the Jagger families. Wondering about the dearth if information for a wealthy, connected family…..wondering who Jeremiah’s wife, Elizabeth, was……could she have been Thurston Raynor’s daughter? Wondering how Jeremiah and others in the family had such close connections to Quakers. I will keep looking for the Usher, Tarbell, Hoyt, Ferris links and keep enjoying the fascinating history of us!